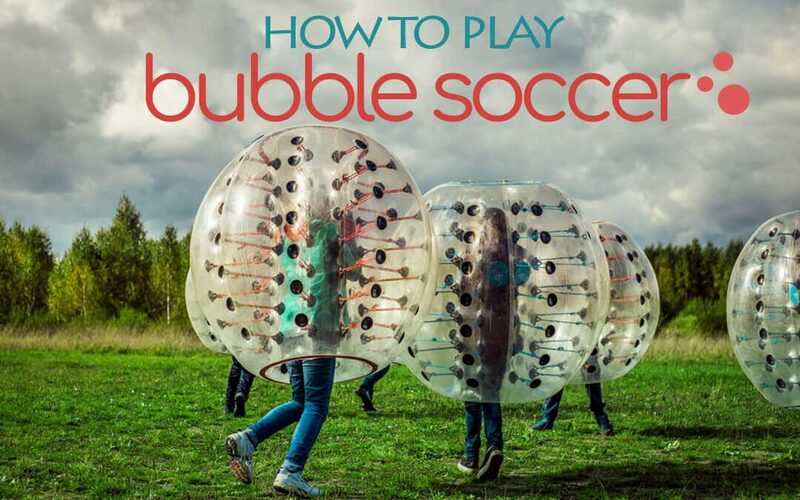 How To Play Bubble Soccer. Hint: It's Hilariously Fun! How to Play Bubble Soccer. Hint: It’s hilariously fun! First, what the heck is Bubble Soccer? Picture this, place a hugely inflated “bubble” around your mid body. The bubble includes handles inside the bubble to grab onto and sits above your waist keeping your legs free to run around. Now add in a Soccer ball and you have, Bubble Soccer! This hilarious game of Bubble Soccer was originally created as a joke in Norway in 2011. It has since taken off as part of the newest craze of ridiculous new games to try. But it’s actually hilariously fun. Imagine running around a soccer field in a giant bubble, bumping into your friends, trying to score a goal. All while laughing hilariously. Bubble Soccer has a US Bubble Soccer Association, and it’s likely that you can find a Bubble Soccer host near you. They are really popular for events or birthday parties. It’s featured as one of our birthday party games for kids because it’s such a different idea for a birthday theme. Plus it gets kids active, outside, and running around. It’s likely that you won’t find these at your local retailer. If you want to purchase your own set of Bubble Balls, you can’t find a bunch of them available on amazon. The large, professional and durable versions of the ball tend to start at $100+. Whereas there are some companies that have released a “backyard” lower quality version starting at $35. The quality obviously will vary greatly between these, and the low end versions are designed specifically for kids. Keep in mind, you need to purchase enough soccer balls for the whole soccer team. Soccer Ball is not played with a designated amount of players on the field, so you are buying for your group of participants. This makes bubble soccer a substantial investment. Because of the large investment required, there are numerous companies across North America that offer bubble soccer rentals for events and birthday parties. Just google bubble soccer and your town to find the closest rental company. 1. Official rules say minimum 3 players per team. Because this is a fun sport, you can even play 1 on 1 with just 2 players. 2. Soccer field or just in your backyard. 3. What to wear? You might fall or bump into a friend and find yourself bouncing to the ground. For that reason, don’t wear any sharp objects, so remove your jewellery before playing. Do not wear loose clothing. Wear runners, not sandles. Duh! 4. If you are playing a regulation game, you will require a referee. How Long is a Bubble Soccer Game? A game of bubble soccer, is not nearly as long as the traditional soccer game lasts an hour and a half. A championship game of buble soccer will last 4 five-minute quarters, for a total of 20 minutes. You are running in a bubble afterall! A regular game of bubble soccer is 10 minutes long, with an optional break at 5 minutes. The rules are really simple for bubble soccer. To begin the game, each team stands on the goal round, with the soccer ball placed in the middle of the field. The referee blows the whistle, and each team then runs towards the soccer ball in the middle of the field. There are no designated positions at all, included a designated goal keeper. You could loose a team mate to getting stuck on the ground at any point. This happens every time a game is scored. There are no “foul or sidelines”. There is no out of bounds, so if the soccer gets a far kick, get running after it. The ref can choose to pause the game if the soccer ball is too close to a group of spectators or into a unsafe area, like a road. This is a fun game! It’s not indented to be overly aggressive, but a fun bounce around game. Therefore, there are no defined rules for what happens in the event of a foul. Really there is none. The ref has the ability to issue foul kicks or remove a player from the game for abusive conduct. When the ref issues a foul kick to a player, the opposing team must give the kicker a 15 foot clear kicking area. If any player is injured or hurt, the game can be stopped to allow the player to leave the field, and make sure they are ok. If a player is on the ground, which happens frequently, you must wait till they get back up till you can bounce into them. One hilarious thing that might happen, the soccer ball might get stuck in a bubble. haha you read that right. In this case, the referee can pause the game, rescue the ball, and then perform a drop kick with a player from each team. I think at one point in our life, we all need to try bubble soccer. Its insanely fun. Here’s a video of bubble soccer in action to prove it. And it’s a favorite idea of mine for kids birthday parties. I think it will make a kids birthday unforgettable. Anything that gets us outside and active, I think is a great idea! Click here to get the latest price.